Hailing from Almonte, Canada, Kelly Sloan’s third studio album sees her take a grittier approach to her self-penned songs than her previous, more acoustic offerings. To this end she has added Jordan Murphy (drums, percussion) and Adam Ledrew (bass) to that of long-time collaborator Curtis Chaffey. Perhaps, unsurprisingly considering her classical background, Kelly has a terrific vocal range and, when the song demands the most minimal accompaniment, her talents in this regard come to the fore. Your Only Ride is the obvious highlight in this category. A statement about the need to live life to the full and appreciating every day, this is a beautifully sung ballad that allows Kelly to bring the sound of her live acoustic performances to the album perhaps more than any other song here. The production on this track is exceptional with Chaffey’s electric guitar playing a significant part in the overall sound of the track but never in a way that impacts on Kelly’s vocal performance. The album is co-produced by Kelly with Mike O’Neill who also contributes backing vocals on a couple of tracks. One of these is Annie Edson Taylor a woman who, it transpires, in a bid to financially secure her later years, decided to use her 63rd birthday in October 1901 to attempt to be the first person to survive a trip over Niagara Falls in a barrel. That she survived may be seen as nothing short of miraculous but, regardless, allows Kelly to celebrate this achievement in song, and a very good song it is too. Sources of inspiration for songs is always a fascination but for originality, housebreaking racoons must be right up there. Tracers is said to be inspired by Kelly’s real life experience of these critters in deepest Canada and with the consistently excellent playing of Chaffey coming to the fore again on this track, it is one of the stand out tracks on the album. The whole album reflects the close working relationship of Sloan and Chaffey. Made of Wood highlights again how his brilliantly simple electric guitar accompaniment works perfectly in harmony with Kelly’s vocals and her desire to use this, and the additional musicians employed here to produce a weightier and grittier feel has worked very effectively. 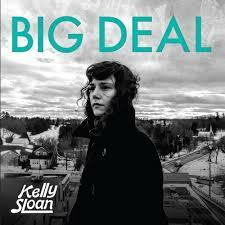 Kelly Sloan may be a new name to most of us on this side of the Atlantic but, as an introduction to her talents as a songwriter, musician and producer, this is very good one.